As noted on KRTV a few days ago, there’s a “Weiner War” going on in Great Falls, with THREE competing hot dog eateries vying for your attention (two restaurants, one cart vendor). So on Saturday, we ventured forth to sample the wares at the new Downtown Dog House, located on 5th Street just a few doors down from Central Avenue. The verdict: woohoo! What a fun place! 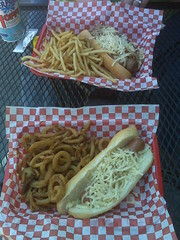 The dogs were tasty, and available with all sorts of condiments and toppings (even a veggie-dog!). And the super-skinny fries and onion rings/strings were delicious. And for dessert: ice-cream cupcakes! Seriously – try the Cotton Candy Fluff cupcake. The atmosphere is fun, the staff (hi Tiffany!) was upbeat and happy, and owner Dave was on hand making sure that everyone was enjoying the food and the fun. A few flat-screen TVs above – two on sports and one on news – and free WiFi make this a winner. Oh, and the huge “garage-door” opening for patio dining is a very cool thing (sorry didn’t get picture yet). And while we were enjoying our dogs, we saw a few friendly folks we know (including blog-buddy GeeGuy!) – everybody seemed to be in a good mood and enjoying the place. So how did the Downtown Dog House stack up against it’s main competitor, Stinky’s? I haven’t tried Stinky’s yet, but Krista ate there a few days ago, and she said the Downtown Dog House was WAY better than Stinky’s. She noted that Stinky’s was OK – until we ate at the Dog House, which she said completely blew away the competition. Stinky’s has a more variety on their menu (sandwiches, etc), but the dog quality and atmosphere just didn’t even come close the Downtown Dog House. So what do you think? Have you tried any of the hot dog eateries? How did they rate? I have tried both products & really think Stinky’s has a better product. There hot dog is made in Montana with 100% beef, the staff was really friendly & love the music. Sandwiches are to die for… You stay downtown while the rest of Great Falls enjoys Stinky’s. It’s apples and oranges for me. Skinless Nathan’s dogs at the Dog House, vs the Still in the casing dog from Stinky’s. Both have good flavor, however vastly different texture. On the HOT DOG alone it becomes a question of what you are in the mood for… almost like the choice of “soup or salad”. Although I’m basing this on only ONE visit to Stinky’s, it will be a long time before I return. At their 10th Ave.S. location, I was met, and seated rather rudely, although our server was cordial. The “hot” dog was only marginally warm, and the fries they raved about in their ads, were limp, soggy and only slightly warm. This was at 3:00pm, not during the lunch rush, and there were only about four other patrons in the place at the time. Had their signature Pom Frites fries been prepared properly (they probably WOULD have been excellent. 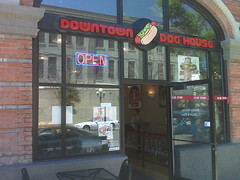 The Downtown Dog House on the other hand, had very friendly help, hot food and crisp fries. I’m not a fan of the “sports” T.V.s nor the fact that this confirmed COKE drinker, had to choose water. (I can’t stand Pepsi), but those personal comments aside, the Downtown Dog House is far superior. I have been back many times, and will continue to frequent this fine establishment. I love the roll-up door and “sidewalk” atmosphere… worthy of a true Nathan’s experience. Anybody know what happened to the Uptown Dog House? We stopped by the Brick for lunch yesterday and they were gone! I really like your site! Maybe you have a facebook or twitter page? I’d love to meet up and talk about a couple of things. Appreciate all of your work.